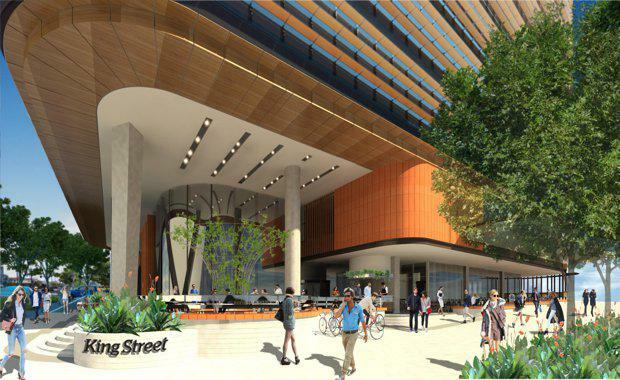 Lendlease has maximised innovation to achieve the Green Building Council of Australia (GBCA) 6 Star Green Star - Office Design V3 certification for its new Queensland head office, Kings Gate, the first commercial tower at Brisbane Showgrounds. Kings Gate’s Green Star rating was awarded without significant and expensive in-building infrastructure, such as a black water treatment or co-generation plant. Rather Kings Gate’s achievement focused on smart design and construction methods, achieving 9.5 out of a possible 10 points for innovation. CEO of Lendlease’s Property business in Australia, Tarun Gupta said Kings Gate was the latest example of new benchmarks for Lendlease’s commercial developments, representing global leadership in environmentally sustainable building practices. “Kings Gate is the latest example of Lendlease’s delivery of high-performance workplaces. It makes an important contribution to the health and wellbeing of our staff and is a benchmark for commercial developments within our organisation,” Mr Gupta said. Designed, project-managed and constructed by Lendlease’s Building business, Kings Gate’s design focuses on energy, carbon and water reduction using advanced technologies and industry best-practice. Energy strategies include a 99 kilowatt rooftop solar array providing clean energy for Kings Gate’s base building energy demand and a state-of-the-art base building lighting system using LED technology. Kings Gate’s passive design features include high performance double-glazed façade and exterior horizontal shading fins, which will reduce the overall cooling load of Kings Gate. A high efficiency thermal plant and a low-temperature variable air volume (VAV) system optimises efficiency and reduces maintenance costs over the building’s lifetime. Water innovations include a rainwater capture system used for toilet flushing. Kings Gate has now reached practical completion and will welcome the first Lendlease staff in early July. GBCA Chief Executive Officer Romilly Madew said Lendlease are pioneers in the green building movement. “Lendlease continues to demonstrate leadership and innovation by creating places that deliver value for the environment, economy and the community. “Kings Gate's achievement of 6 Star Green Star – which was achieved for less than a one per cent cost premium over a conventional building – demonstrates the possibilities when a steadfast commitment to sustainability is integrated early in a project. “From Australia’s first workplace to achieve the ‘trifecta’ of 6 Star Green Star ratings at The Gauge in Melbourne to the first ever 6 Star Green Star certified community at Alkimos Beach in WA, Lendlease’s sustainability story is a series of firsts and the team continually challenges the industry to seek more sustainable outcomes,” Ms Madew said. Mr Gupta said sustainability is not only one of Lendlease’s core tenets, it is a key competitive advantage. Brisbane Showgrounds is a 22 hectare site including a 5.5 hectare redevelopment partnership between Lendlease and the RNA, with an estimated end value of $2.9 billion. The 15-year redevelopment will include commercial and residential components and a new high street, King Street, which will include a 1,200 square metre supermarket and 800 square metres of specialty retail.